WIN 1 of 10 Double Passes to THE CROW Q&A Screening with James O’Barr! Ausgeek in association with Swinburne University will host a special event screening of THE CROW this Saturday October 1st with an introduction by creator James O’Barr, followed by an in-depth Q&A. GRIM PICKINGS this week includes key dates to dismember with the theatrical release of what’s being touted as Tim Burton’s best in twenty years to the home entertainment arrival of the year’s most successful horror film at the Australian & New Zealand box office. Australian Theatrical Release Date, Poster Art & Trailer Revealed for THE NEON DEMON! Madman Films have just revealed an Australian theatrical release date of October 20th for Nicholas Winding Refn’s THE NEON DEMON along with fresh poster art and a localised trailer. When aspiring model Jesse moves to Los Angeles, her youth and vitality are devoured by a group of beauty-obsessed women who will use any means necessary to get what she has. THE NEON DEMON stars Elle Fanning (SUPER 8), Jena Malone (DONNIE DARKO), Abbey Lee (MAD MAX: FURY ROAD) along with Keanu Reeves & Christina Hendricks. CAT SICK BLUES Filmmaker Dave Jackson Gives Us His Top 5 Cat Films! As we revel in the home entertainment release of the multi-award-winning CAT SICK BLUES, we caught up with the menacing puppeteer behind the film, co-writer/director Dave Jackson to grab his Top 5 Cat Films. 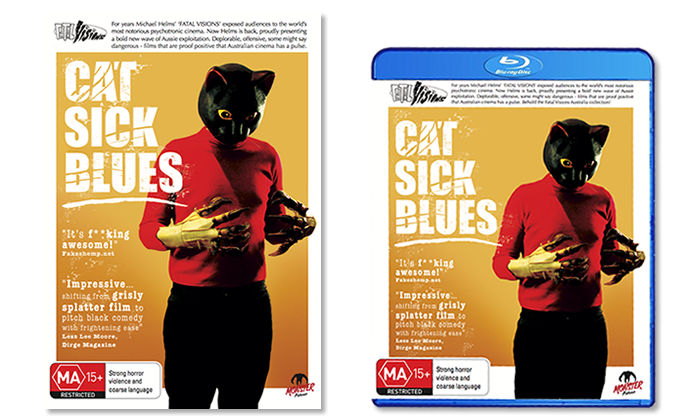 CAT SICK BLUES is the first volume in the all-new FATAL VISIONS series and is now available on DVD at all good retailers across Australia and exclusively on MOD Blu-ray at the Monster Shop. GRIM PICKINGS this week includes key dates to dismember with festival and event screenings across the country to the home entertainment arrival of a killer who only needs nine lives. WIN 1 of 5 DEAD RISING: ENDGAME on Blu-ray! Based on the best-selling video game franchise comes the zombie-infested, action-packed sequel to the 2015 hit Dead Rising: Watchtower, which sees Investigative reporter Chase Carter (Jesse Metcalfe) return to the quarantined zone of East Mission City to expose a deadly Government conspiracy. Confirmed Australian Theatrical Release Date for ANNABELLE 2 and Trailer! Roadshow Films have just unleashed the first teaser trailer for ANNABELLE 2, a sequel to the 2014 spin-off of THE CONJURING. Helmed by David F. Sandberg, fresh off his debut feature LIGHTS OUT, the one minute teaser already looks more exciting than the ninety odd minutes of its predecessor so there’s still hope for this one yet. Taking place several years after the tragic death of their little girl, a dollmaker and his wife welcome a nun and several girls from a shuttered orphanage into their home, soon becoming the target of the dollmaker’s possessed creation, Annabelle. 100 TEARS & BLOODMOON Screening Tonight in Melbourne! Local film critics, podcasters and general nerdy cinematic ramblers, FakeShemp.Net are presenting what they’ve dubbed a ‘Splat n’ Slash’ double-feature tonight at The Backlot Studios, as part of this year’s Melbourne Underground Film Festival (MUFF). You catch the director’s cut of modern maestro of gore, Marcus Koch’s 100 TEARS along with the cult 1990 Aussie slasher BLOODMOON, together on the very same bill. The screening will also feature a video introduction by Koch prior to 100 TEARS and the infamous theatrical “Fright Break” has been restored to BLOODMOON…what a time to be alive and living in Melbourne. GRIM PICKINGS this week includes key dates to dismember with the theatrical release of what has fast become the most anticipated horror film of 2016 to the home entertainment release of some quality DTV fodder.